Cyber Monday was one week ago today, but there weren’t many tablets and ereaders on sale this year. Today is Green Monday (apparently that’s a thing now too) and there’s some better deals than Cyber Monday. LG G Pad 8.3 Tablet – On sale for $179 on eBay via Newegg. Probably the best deal on this list in terms of specs and price. Kindle Fire HD 7 – This year’s new Fire HD 7 is marked down by $25, so it’s $114 for the 8GB model and and $134 for 16GB. 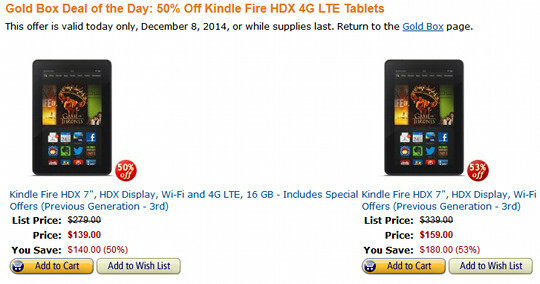 Kindle Fire HDX – The 7″ Fire HDX is marked by $20 for 16GB, $40 for 32GB, and $60 for 64GB. The 4G LTE version is marked down by $140, making it just $139. It’s actually $40 cheaper than the WiFi-only model. Fire HD Kids Edition – The Kids versions of the Fire HD are marked down by $30 off the regular price, making the 6-inch one $119 and the 7-inch $159. Kindle Staples Deal – Staples is running a deal on Kindle devices where they are giving away $25 – $30 gift cards with a purchase. Devices include the $79 Kindle, Kindle Paperwhite, Fire HD 7 and Fire HDX tablets. Some of which are on sale as well. Samsung Galaxy Tab Pro – The 8.4″ Galaxy Tab Pro is on sale manufacturer refurbished via eBay for $189 (Best Buy also has them on sale new for $229). Samsung Galaxy Tab 4 Nook 7 – B&N has the 7-inch Nook Galaxy Tab on sale for $159. Nook Touch GlowLight – Groupon has the older E Ink Nook Touch with GlowLight on sale for $62.99 for manufacturer refurbished units. That’s $37 off the price of a new one. Update: Initially I thought this was the newer Nook GlowLight, but it’s the older one so it’s not really a very good deal at all. The $79 Kindle or the refurbished Paperwhite below is a much better value than this outdated thing. Kindle Paperwhite – Unfortunately Amazon doesn’t have any of their E Ink Kindles on sale right not, but the certified refurbished Kindle Paperwhite is $99, $10 off the usual price and $20 off the price of a new one. Kobo Aura – At some point the Kobo Aura is supposed to go back on sale for $99, but right now it’s still showing $139. Keep checking because Kobo has this ad saying it’s on sale, so it’s bound to happen sooner or later. Also see the Staples deal mentioned above for Kindle Paperwhite and $79 Kindle deals. You’re right. For some reason I thought it was the newer model. That’s not a very good deal at all for the older one. Thanks for confirming that. I already have a Nook simole touch which i love, the sd expansion, the ergonomics of it, and as you mentioned in a youtube comparison the Fonts are really nice and crisp. I love the font sizes. I do want to add another ereader with lighting for use when traveling. I’m disappointed with the inability to not use line spacing on side-loaded epubs with the Kobo H2O, is that also an issue with the Kobo Aura 6″ version also considering they have the same software? Yeah, Kobo’s software is basically the same on all their ereaders. I think you can use Calibre to fine tune line spacing but it’s not exactly convenient. Amazon is running a sale on its eReaders again; $99 for Papaperwhite and $59 for Kindle Touch with ads.